Please follow the following instructions to download and install VerseVIEW on your Windows or MAC PC. Scroll to the bottom of the page and click on Adobe AIR. Then click on VerseVIEW Software and install it. Download the Adobe AIR and VerseVIEW Software files on a USB Flash drive. Then following the steps above to install Adobe AIR and then VerseVIEW software. Please see the user manual for steps for properly entering the lyrics. The following steps shows how to add a search database to your VerseVIEW. 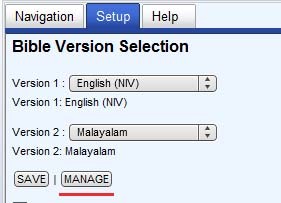 Please note that the corresponding Bible translation have to be installed before installing the search database. Select the SETUP tab and click MANAGE button. Click on ADD SEARCH DB button. The search database will get installed and a dialog will pop up. Click OK to close the dialog box and then click CLOSE. VerseVIEW 4 has the NOTES feature. This allows users to take notes specifically for a verse. Notes can be reviewed for a chapter or as a topic. 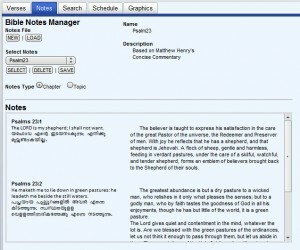 This tool could be used to create and distribute notes for Bible study, Sermons or Sunday School. Create NEW Notes – Prompts the user to a Name and Description for the new notes. Clicking SAVE will generate a new Notes database. LOAD Notes from a file – This will open up a file browser dialog box and the user selects the .db file that contains the Notes database. SELECT Notes – The pull down list shows all available VerseVIEW notes on the system. Clicking SELECT will make the selected note active. Any new notes entry will go to this database. DELETE Notes – This allows to delete inactive notes. The Default Notes and active notes can not be deleted. SAVE Notes – Saves the notes to Desktop under a folder named “vvnotes”. This file can be zipped and distributed to others. Notes TYPE – Selecting Chapter shows the notes for the current selected chapter. Selecting Topic shows all the notes within the selected Notes database. Notes can be entered from the main verse page or from search results page. Clicking on the notes icon will launch a notes entry box. SAVE will add or append the notes to the database. This information should help in creating XML Bible Database for VerseVIEW. 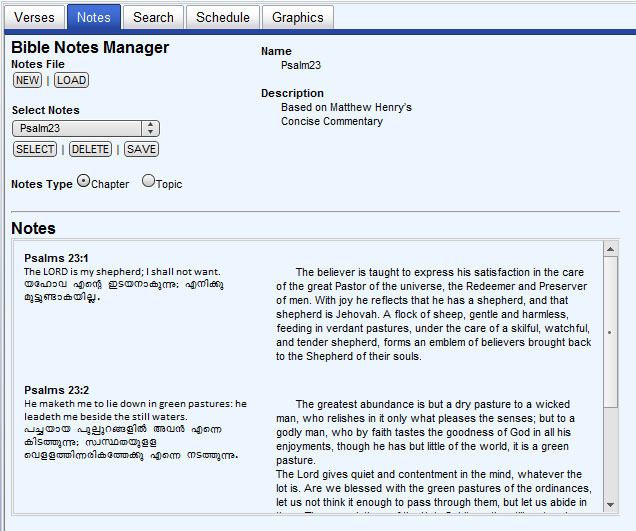 VerseVIEW uses XML to store the verse of the Bible and other information. The following is an example of the header for spanish_reina.xml file. The first line is a standard header. The encoding field can be changed if the text is not in UTF-8 encoding. The “fname” field should match the name of the file. The “revision” field is numeric and needs to be updated when new revisions are created. The “title” field is what shows in the VerseVIEW setup screen. The “font” field defines the font for the text. From version 4 on, this field is comma separated and the user can select the desired font from VerseVIEW. The “copyright” field is what shows at the bottom of the presentation screen. The “sizefactor” field is not implemented yet. Use the “b” tag defines the books. The “c” tag defines the chapter and “v” tag defines the verse. Each of the verses are within the “v” tag.